The number of income tax returns that will report income tax savings from charitable donations is projected to plummet from 37 million in 2017 to just 16 million in 2018. The staggering decline of 21 million returns is due principally from two changes in the Tax Cut and Jobs Act of 2017: (1) limiting the itemized tax deduction for state and local taxes to $10,000 per return ($5,000 for married taxpayers filing separately); and (2) increasing the standard deduction to $12,000 on single returns, $24,000 on married joint returns and $18,000 on head-of-household returns—with even higher thresholds for individuals over aged 65. The chart below illustrates how these changes will cause millions of itemizers to convert into non-itemizers. It demonstrates the outcome for a taxpayer who pays $20,000 of state and local taxes and who pays a combination of $5,000 of mortgage interest and charitable gifts. 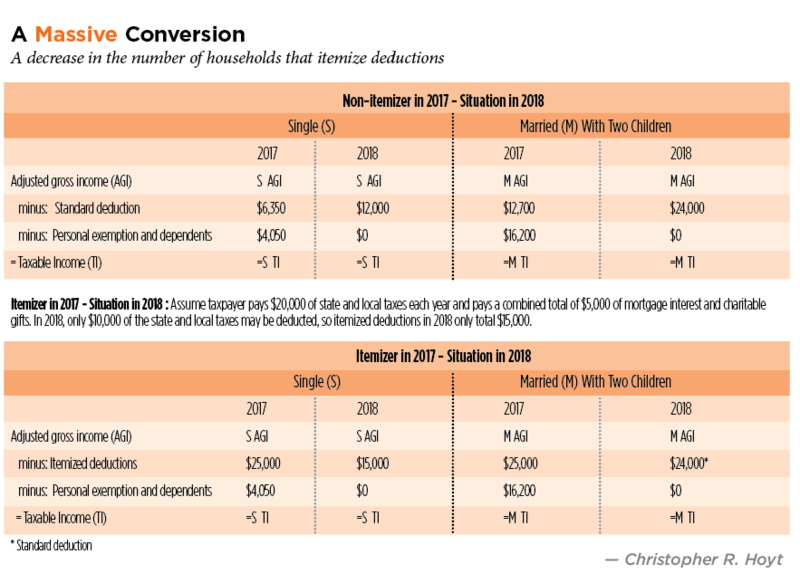 Among households with incomes between $86,000 and $150,000, the percentage of tax returns that will report itemized deductions is projected to fall from 39 percent to just 15 percent. For individuals over 70½, the good news is that no change was made to the law that permits them to make charitable gifts from their individual retirement accounts without recognizing taxable income. These individuals are therefore still able to get income tax savings from their charitable gifts. They can, for example, make charitable gifts from their IRAs and apply those gifts to satisfy their required minimum distribution obligation for the year, yet pay no income tax on those charitable IRA distributions. There are hundreds of thousands of individuals over 70½ who’ve never taken advantage of this law. They saw little point in making charitable gifts from their IRAs because they were able to get tax savings by claiming itemized tax deductions for their charitable gifts. Please allow this article to serve as a wake-up call. Determine whether your clients will be able to itemize their tax deductions in 2018. If not, then they should immediately stop making charitable gifts the way that they have in the past. Instead, they should start using their IRA to make all future charitable gifts. The law, commonly referred to as a “charitable IRA rollover,” permits individuals over 70½ to make charitable gifts directly from their IRAs to eligible charities and exclude the distributions from their gross income. The price: There’s no itemized charitable income tax deduction for such an IRA gift. However, if a taxpayer isn’t able to itemize income tax deductions, then there’s, effectively, no price to pay. Taxpayers who used to itemize their deductions but no longer can, should (in theory) make every charitable gift from their IRAs. IRA administrators should expect a surge of requests in 2018 compared to prior years. The primary obstacle is the practical impediment of making numerous small gifts—for example, $20 or $50—from an IRA. One practical solution is an “IRA checkbook” offered at some brokerage houses, where each check is a distribution from the IRA. By having the IRA account owner write a check for any dollar amount and then mailing the IRA check to the charity, the IRA checkbook alleviates the administrative burden that would otherwise be imposed on the IRA administrator. For taxpayers under the age of 70½, a strategy to be able to itemize charitable deductions is to “bunch” several years of tax deductions into selected years. For example, someone who donates $5,000 per year to charities might donate a total of $15,000 in one year and nothing in the next two years. The large number of charitable gifts might permit the taxpayer to itemize tax deductions that year, thereby generating tax savings from the charitable gifts, and then take the standard deduction in the next two years. Note that such a strategy throws havoc into the cashflow projections of the charities. Consequently, the best way to accomplish this strategy is to make the bunched gifts to a private foundation or a donor-advised fund. The PF or DAF can then make distributions each year to the charities. The Internal Revenue Service now permits DAFs, but not PFs, to satisfy legally binding pledges. Thus, a donor can make pledges to the charities and use the bunched-giving strategy to satisfy those pledges. Time will tell whether, and by how much, the loss of itemized tax deductions might reduce the number of charitable gifts received by the nation’s charities. But, there’s one very large group of donors who still can get income tax savings from all of the charitable gifts that they make: seniors over the age of 70½ who have IRAs. This is an adapted version of the author’s original article in the June 2018 issue of Trusts & Estates.